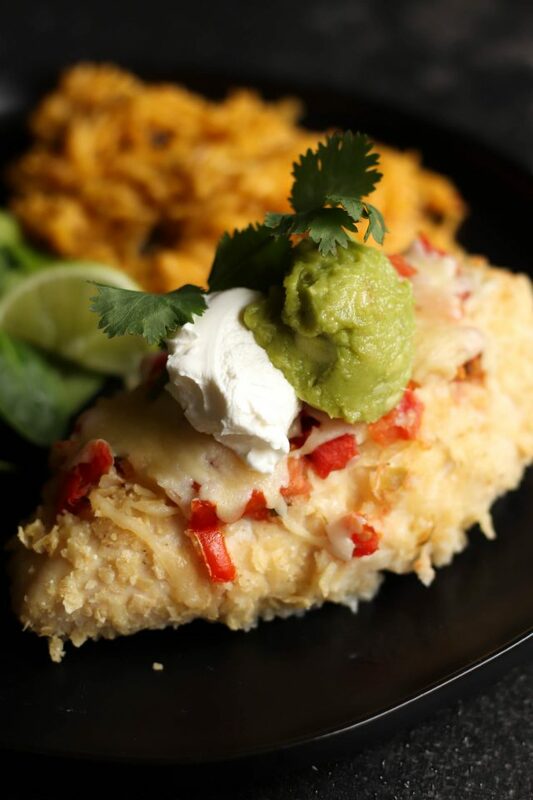 Our Chips and Salsa Chicken Bake is breaded with tortilla chips and topped with salsa and cheese, making it the perfect weeknight meal to use up your leftovers. You know when you reach the bottom of the chip bag, or the end of the salsa, and there’s just not quite enough to do anything with? 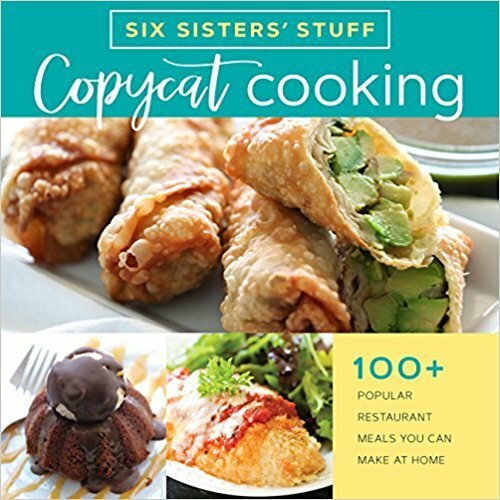 That’s where this recipe comes in! 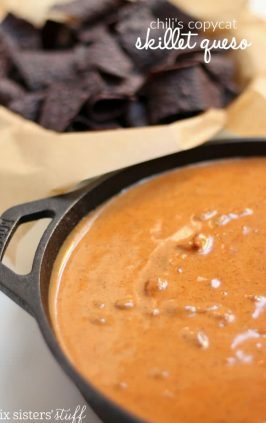 It’s the perfect way to use up that last one-fourth of your tortilla chips or the bottom of your salsa container. 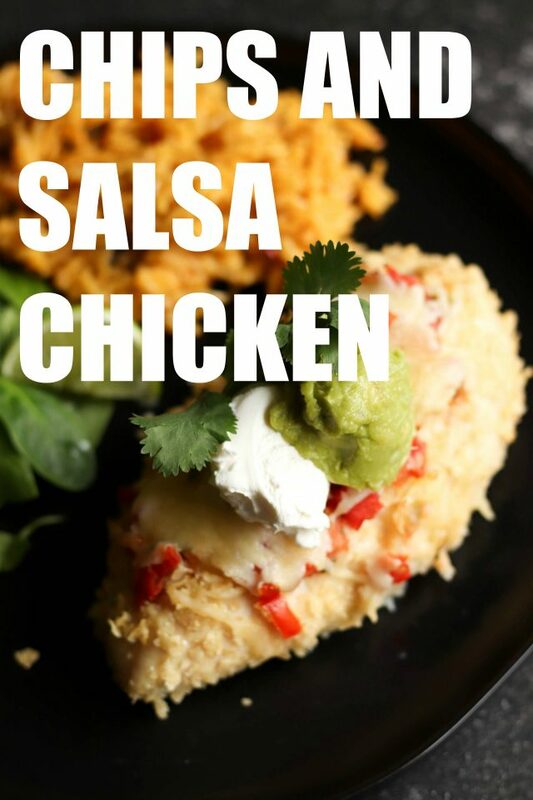 Chips and Salsa chicken takes your boring chicken breast dinner and turns it into something kid-friendly and new. 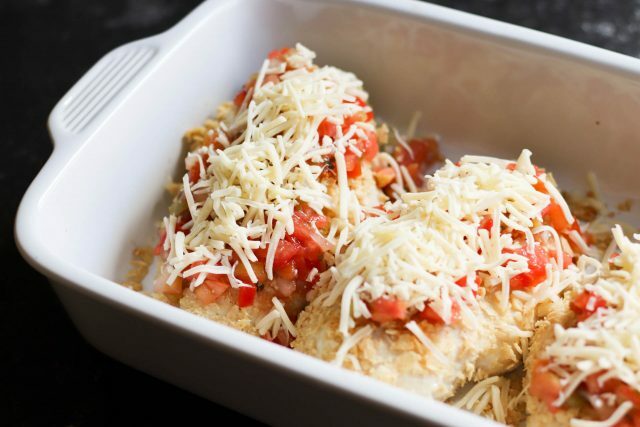 With the breaded chicken topped with salsa and cheese, it’s sure to be a big hit with your whole family. Step 1: In a small, shallow bowl or container, combine lime juice, honey, and oil. 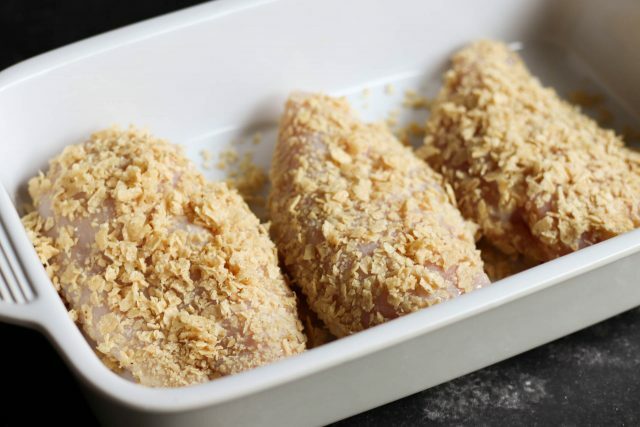 Step 2: Dip both sides of the chicken in the lime juice mixture, then coat with crushed chips. Step 3: Place in an ungreased 9×13″ baking dish. Bake uncovered at 350 degrees for 30-40 minutes or until juices run clear. 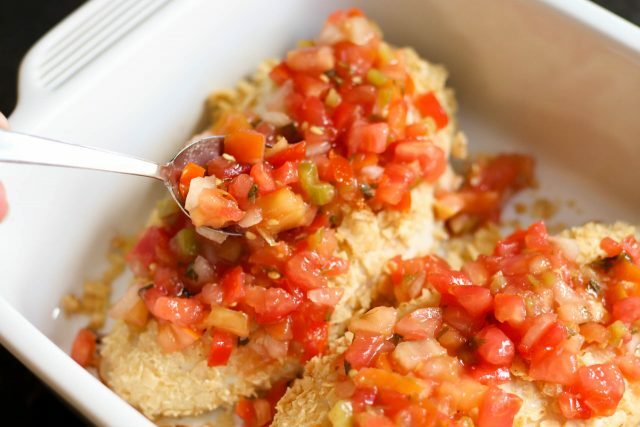 Step 4: Spoon a tablespoon or two of salsa over each chicken piece. Step 5: Sprinkle with cheese, then return to the oven and bake for about 15 more minutes, just until the cheese melts. Step 6: Serve with guacamole and sour cream and garnish with fresh cilantro. To lighten this recipe: try grilling the chicken (without breading it). 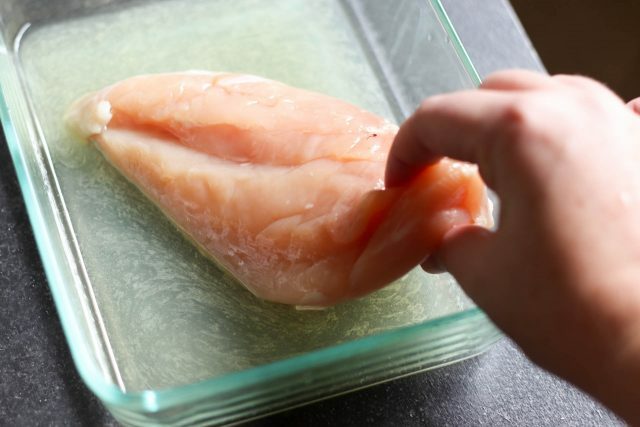 The lime juice is a pretty good marinade, and if you let it set for about 30 minutes, and then grill it, it would cut back on quite a few calories. Top with salsa and cheese, then broil it for a few minutes to melt the cheese. Use a homemade salsa: a chunky store-bought salsa will still taste delicious, but try using our copycat chili’s salsa or our blender salsa on top. Perfection. Switch up the toppings: We love this with fresh diced avocados, different kinds of cheeses (usually whatever we have in our fridge), or even plain greek yogurt. Our Chips and Salsa Chicken Bake is a breaded with tortilla chips and topped with salsa and cheese, making it the perfect weeknight meal to use up the leftovers in your fridge. Combine lime juice, oil, and honey. 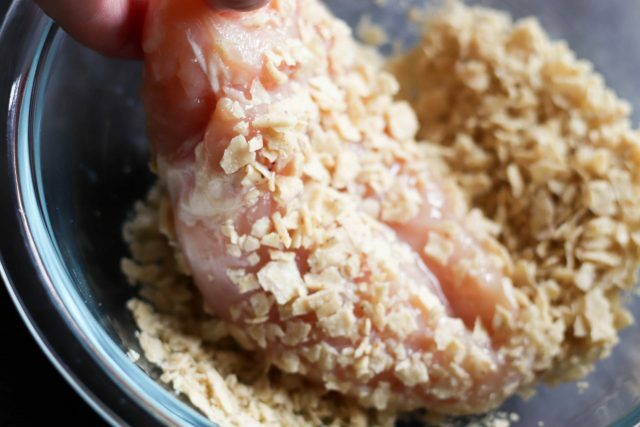 Dip both sides of the chicken in the lime juice mixture, then coat with crushed chips. Place in an ungreased 9 x 13 inch baking dish. Bake uncovered at 350 degrees for 30-40 minutes or until juices run clear. Spoon a Tablespoon or two of salsa over each chicken piece and sprinkle with cheese, then return to the oven and bake for about 10 more minutes, just until the cheese melts. Serve with guacamole and sour cream and garnish with fresh cilantro. 2 happy parents and 2 happy kids with this meal! So easy to make and made it exactly the way it was described! Thank you!